It is hard to imagine our local news landscape without the thoughtful, ethical, and tireless coverage provided by Eastern Group Publications. It all began with Joseph Kovner’s founding of the Eastside Sun in 1945. In 1979, Dolores and Jonathan Sanchez bought the Sun and its sister newspapers and founded Eastern Group Publications. The papers organized under the EGP banner have provided readers with important, unique, and professional reporting on issues vital to our communities. It has been my privilege to have known Dolores Sanchez and her family for many years. I always looked forward to reading the sterling journalism that EGP produced under their leadership. While I understand the family’s choice to close the company after 39 years of dedicated ownership, the end of EGP is a deeply felt loss for our communities. Because of its integrity in reporting, generations of readers have turned to EGP papers for news and information. EGP has reported about government action without fear or favor. It has kept readers up to date on matters ranging from economic development, to health care, to immigration, to education, to the fight for environmental justice. It has trumpeted the accomplishments of our neighbors for all to see, and it has spread the word about community events that bring us together. Week after week, it has reported the news in both English and Spanish, demonstrating that the unifying power of the news can transcend differences in language and empower individuals of all backgrounds. EGP’s record as a reliable news source has been a boon to our neighborhoods and to our public discourse. When our news media keeps us well-informed, we can speak with knowledge, make better decisions for ourselves and our families, and reach new heights of accomplishment. That is EGP’s legacy to our communities, and that is why it is so saddening to bid it goodbye. After reading the work of EGP for decades, it will be difficult to get accustomed to a world where we no longer have its insightful reporting and commentary. I am sure many of my fellow readers feel the same way. Thank you to the Sanchez family, and all those who have been a part of EGP over the years, for your unwavering dedication to building and sustaining a company that did so much to enlighten our communities and bolster our civic life. 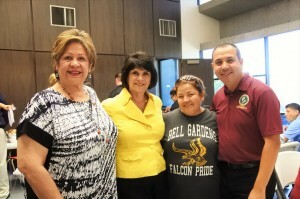 Congresswoman Lucille Roybal-Allard represents California’s 40th District, which contains the communities of Bell, Bell Gardens, Commerce, Cudahy, Downey, Huntington Park, Maywood, Paramount, Vernon, and parts of Bellflower, East Los Angeles, Florence-Firestone, and South Los Angeles. California members of Congress were in Los Angeles Wednesday where they held a roundtable discussion with young immigrants currently protected from deportation under the Deferred Action for Childhood Arrivals (DACA) program and by Temporary Protected Status (TPS). House Democratic Leader Nancy Pelosi (CA-12) — joined by Congress members Lucille Roybal-Allard (CA-40), Judy Chu (CA-27), Jimmy Gomez (CA-34) and other local leaders — said during a post-discussion press conference at the headquarters of the Coalition for Humane Immigrant Rights CHIRLA, that federal lawmakers are working to pass “clean” legislation that would give the young immigrants, often referred to as “dreamers,” permanent legal status, but not tied to construction of a wall on the U.S.-Mexico border. Pelosi and the Democrats said by the end of the year they hope to have the votes needed to pass the Dream Act 2017, a bipartisan bill introduced by Roybal-Allard, a Democrat, and Congresswoman Ileana Ros-Lehtinen, a Republican. “All we need is to vote,” said Pelosi, adding that “dreamers” have led a dignified crusade to get support for the bill. “The president must support this legislation because the American people are supporting it,” Pelosi said. Twenty Republican votes are needed to move the Dream Act forward, according to Pelosi, who pointed out that some of the votes belong to Republicans from California. She said it’s a “marathon race” to the goal, suggesting that a vote could come before Thanksgiving Day. “They gave their information, they signed up for DACA, believing in this country. And to do anything else but to protect them by passing the Dream Act is a betrayal, and would be a disgrace and a very ugly mark on this country,” Roybal-Allard said. For Congressman Jimmy Gomez, who represents a large number of dreamers, Pelosi’s remarks are not only about a political strategy but also about public opinion in the country, including among conservatives. “We know that 82 percent of Americans support ‘dreamers’, the debate will not end until this bill has been approved,” Gomez said. “Definitely, the only weapon is to put pressure on these (Republican) congressmen who have already expressed their support and are repenting,” said DACA recipient and roundtable participant Mariana Villafaña. Although Villafaña is not completely convinced public opinion can change the minds of Republicans, she believes the key is to target districts whose legislators are at risk of losing their seat to a Democrat. Pelosi said she understands the frustration of dreamers who say they reject any strategy to legalize their status that does not also include legalization for all 11 million immigrants in the country without authorization, but stressed that as of now there is not enough “political capital” to achieve that goal. “I would have liked to hear a little more force in the demands of the conservatives, but I understand that this is a strategy and we have no choice but to continue this struggle. December is the goal,” said Villafaña. Democrats have threatened to block in the coming months any legislation Congress needs to keep the government going, such as the new federal budget for which Trump needs the support of Liberals if he wants to avoid a government shutdown. Over a dozen local organizations and families in need received Thanksgiving turkeys last week in Huntington Park during Golden State Water Company’s annual Operation Gobble. The company donated 100 turkeys and an anonymous donor donated 137 gift certificates for turkeys. 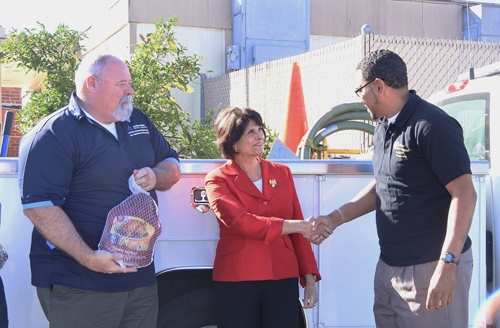 Congresswoman Lucille Roybal-Allard (CA-40) was at the event at the Oldtimers Foundation, where she greeted local organizations receiving donations. Turkey recipients included A Place Called Home, Coalition for Humane Immigrant Rights of Los Angeles, Eastmont Community Center, East Los Angeles Community Service Center, Edison Middle School, Gage Middle School, Garfield High School’s University Prep Program, Life After Uncivil Ruthless Acts, Elizabeth Learning Center, Family Health Care Centers of Greater Los Angeles, Gage Middle School, Oldtimers Foundation, Our Lady of Victory Parish, Soledad Enrichment Action, and Volunteers of East Los Angeles. By the time the polling booths closed Tuesday in California, Southeast Los Angeles County residents attending a “Bad Hombres and Nasty Women” election night party were already glued to their phones and TV screens, anxiously watching the electoral votes tally up against their candidate, Hillary Clinton. 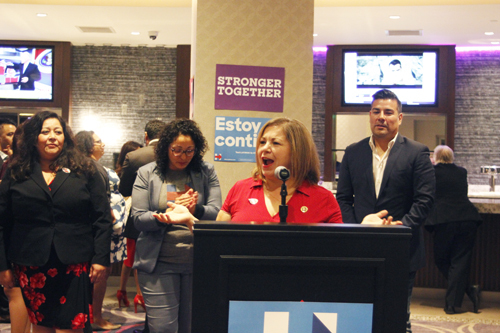 The tongue-in-cheek event, hosted by Democrat Assemblywoman Cristina Garcia at The Bicycle Casino Hotel in Bell Gardens, was supposed to be a victory celebration, after all, almost all the polls earlier in the day had signaled victory for Clinton. Instead, a Donald Trump piñata sat untouched at the bar and a solemn mood persisted throughout the night. Garcia kicked off the evening by asking attendees to stay focused and hopeful, despite Trump’s early lead. “Irrespective of what happens we must show unity,” she told the crowd. 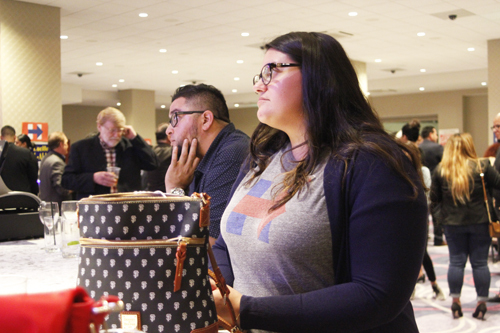 Yet, as the clock moved closer to midnight and projections for key battleground states like Ohio, Florida and Iowa brought Trump closer to the 270 electoral votes he needed to secure the election, the bar got busier as attendees struggled with disbelief. “I can’t believe this is happening,” one person said. “How did it get like this,” asked another in shock. The local elected officials, campaign strategists and residents tried to do the math and tally the numbers, hoping for a Hail Mary victory for Clinton, but it was increasingly clear the night would not end as they’d hoped, and the impact would be far-reaching. “Even if she wins, it’s very disappointing that someone who has dishonored our culture, insulted every minority, talked [disparagingly] about immigrants – and in spite of all that, so many people supported him …even Latinos,” a dismayed Congresswoman Lucille Roybal-Allard told EGP . The cloud from the presidential race made it difficult for elected officials at the event to celebrate their own victories: Garcia was reelected to serve the 58th District, Sen. Ricardo Lara will contine to serve the 33th District, Rep. Linda Sanchez, chair of the Hispanic Caucus, will once again represent District 38 in Congress and Roybal-Allard, the first Mexican-American woman elected to Congress easily held on to her seat in the 40th District. In the early hours of the morning, business mogul and TV personality, and now President-Elect Donald Trump would rule the night, beating former Secretary of State Hillary Clinton, receiving 279 electoral votes to Clinton’s 228. Clinton was ahead in the popular vote. “If it passes I’m hoping it will create a win-win and we can all sit at the table and start to fix our neighborhoods,” he told EGP. “In a way the repair of the 5 freeway was the main concern for Commerce, the expansion of the freeway needs to happen right, not 20 years from now. Cuando Donald Trump, el nominado republicano a la presidencia, empezó su campaña llamando a los mexicanos “violadores y traficantes de drogas” los latinos fueron empujados hacia el frente de la retórica política. Todo, en una búsqueda de marginalizar la importancia del grupo y de su valor al país y por ende, causó que múltiples campañas empujen a los latinos hacia las urnas. El poder del voto latino, en años recientes, ha sido arraigado como un posible punto de inflexión en las elecciones nacionales. Esto es tanto que los Demócratas como los Republicanos han mencionado la importancia que éste voto tuvo en la victoria de Barack Obama a la presidencia hace 8 años. Esfuerzos para persuadir a los residentes permanentes latinos a convertirse en ciudadanos, para que puedan votar en noviembre, subieron significativamente, al igual que las campañas para registrar a los votantes elegibles. De los 27 millones de votantes elegibles, más de 13 millones son esperados a que se dirijan a las casillas de votación en noviembre, de acuerdo al Centro de Investigación Pew. En ésta serie de dos partes, EGP habló con varios oficiales latinos electos, de California, acerca de la historia, poder e influencia que los latinos han tenido en la política. Ellos describieron las luchas y discriminaciones a que los latinos se han enfrentado tanto como en el pasado como en el presente. Tambien admitieron que ha habido progreso, como el numero de “primerizas en la política” las cuales incluyen a latinos encabezando grupos legislativos en California y a más latinos que ahora sirven en comités poderosos en el congreso y en el gabinete presidencial. Sin embargo, todos acordaron de que todavía hay un gran camino por recorrer para fortalecer el poder político latino. Ellos también hablaron acerca de la evolución de lo que significa ser un candidato latino, o el ser digno del apoyo latino. En California, la carrera para el Senado de Estados Unidos, entre la representante Loretta Sánchez y de la fiscal estatal de estado, Kamala Harris, en varias maneras resalta esos cambios e indica la complejidad del poder y la influencia. Esa elección tiene el potencial de producir una “primeriza política”. Si es electa, Sánchez sería la primer latina en servir como senadora de Estados Unidos. En cuanto Harris, se convertiría en la primer mujer afro-americana y la primera asiática-americana al mismo puesto, si es electa. La segunda parte de ésta serie analizará más a fondo lo que está en juego para los latinos el Día de Elecciones y lo que significa para los latinos postularse como candidatos. La Elección Presidencial a polarizado a muchos y las encuestas demuestran que aun permanece reñida. Al igual, ha impulsado a docenas de organizaciones sin lucro y a grupos de derechos humanos a lanzar campañas de alcance intentando registrar a latinos elegibles para votar. De acuerdo a un reporte del Centro de Investigación Pew, los latinos componen alrededor del 15% del electorado en Florida, Nevada, Colorado, todos estados decisivos y disputados. En noviembre, se proyecta que los votantes latinos llegaran o totalizar 27 millones de personas, un 11.9 por ciento de los votantes elegibles en el país, de acuerdo al reporte. Mientras que los números siguen creciendo, la participación electoral entre los latinos no ha sido impresionante. A pesar de que 11.2 millones de latinos, un número récord, salieron a votar en el 2012, este número representó menos de la mitad del grupo elegible para votar. “Sí, los latinos pueden determinar la elección ya que tenemos la cantidad necesaria”, reconoció la representante de Estados Unidos, Lucille Roybal-Allard. “Mi temor es que [ellos] no salgan a las urnas”. En cambio, los votantes afro-americanos y blancos son más probables en aparecerse el día de la elección. En 2012, 64 por ciento de los votante elegibles de la comunidad blanca y el 66.6 por ciento de los afro-americanos salieron a votar. Alex Padilla, secretario estatal de California, se está uniendo con colegios y universidades al igual que otras organizaciones a lo largo del estado para motivar a los votantes a que se registren. Él dice que la importancia de votar es usualmente impuesta cuando los padres llevan a sus hijos a las casillas de votación, una experiencia desconocida para muchos inmigrantes latinos. “Mis padres nunca me llevaron a votar, no fue nuestra experiencia”, le dijo a EGP. “Demasiadas familias carecen de ésta tradición”. Ya que casi la mitad de los votantes elegibles para votar, en la comunidad latina, son de las edades 18 a 35, un grupo ya predispuesto a no votar, atención especial se ha dirigido hacia ellos, los llamados “mileniales” (o Millennials en inglés). La organización sin lucro, Voto Latino, busca empoderar a los latinos mileniales a participar en compromisos cívicos y reportan a más de 101,000 latinos registrados. La próxima batalla será motivarlos a que se hagan presente el día de la elección. “Ésta elección es sumamente importante” para los latinos, le dijo a EGP Hilda Solís, supervisora del Condado de Los Ángeles. Especialmente “cuando se escucha a Donald Trump decir ese tipo de cosas”, dijo la hija de inmigrantes, refiriéndose a los comentarios despreciativos hacia las mujeres, inmigrantes, especialemente a los mexicanos. La exsecretaria de labor, ha estado trabajando en campañas a favor de la candidata presidencial demócrata y exsecretaria de estado, Hillary Clinton. Ella considera a Clinton una “buena alternativa para nuestra comunidad”. “Creo que tiene un buen récord en su representación de nuestra comunidad y creo que nombrará a más latinos a posiciones en su gabinete presidencial”, dijo Solís. Roybal-Allard le digo a EGP que a menudo escucha que los latinos dicen que “para qué” deberán votar, pero espera que consideren las consecuencias de no hacerlo en estas elecciones. “Si se quedan en casa es como que estén votando por Trump”, agregó. El lunes, un grupo de votantes registrados asistieron al taller, “Voting Basics” en Commerce para mejor informarse antes de las elecciones del 8 de noviembre. “A estas alturas, simplemente estoy votando por el menor de los dos males”, dijo Ivette Sandoval. Miembros de la comunidad en el taller “Voting Basics” en Commerce el pasado lunes. Foto de EGP por Nancy Martínez. De acuerdo al Centro de Investigaciones Pew, un factor principal en quien recibirá el apoyo de los votantes es su desagrado por el otro candidato. Rep. Sánchez le dijo a EGP que no importa por quien voten, los latinos necesitan preocuparse en ser representados en las urnas. “Cuando nuestra comunidad no vota, le damos el poder a los que sí”, dijo ella. Según los reportes de EGP, en la primera parte de ésta serie, durante los años pasados cuando habían pocos latinos en posiciones electas, el ser latino era a veces la calificación más importante para obtener el apoyo de la comunidad. La creencia de que un candidato latino tendría una comprensión mayor y sensibilidad a los temas relacionados con los latinos era importante. Antes, no se escuchaba de que latinos apoyaran a candidatos que no fueran latinos, dentro del mismo partido. Sin embargo, la carrera hacia el Senado entre Sánchez y Harris, muestra que las cosas han cambiado. En su mayoría, el hecho de que Sánchez es latina es un factor, pero no es el motivo principal del apoyo que ha recibido. “Es una persona trabajadora, dedicada y conocedora”, dijo Roybal-Allard, quien ha trabajado con Sánchez por casi dos décadas. “He presenciado su dedicación no solo a la comunidad latina sino que a nuestro país”. Roybal-Allard le dijo a EGP que también apoya a Sánchez para asegurarse de que aya alguien en el Senado que sea sensible a las necesidades del Sur de California. “El hecho de que es latina es una ventaja adicional”, dijo. Sánchez misma admitió que a veces no siempre se necesita elegir al latino. “Miren a la carrera presidencial, yo no iba a votar por Ted Cruz”, dijo ella. En lugar, Sánchez le pide a los votantes a que analicen sus calificaciones, enfatizando que durante los 20 años que sirvió en el Congreso, ella fue parte del Comité de Servicios Armados y el Comité de Seguridad Nacional. Ella también votó en contra de la Guerra en Iraq y apoya a la reforma migratoria y a los negocios pequeños. El número creciente de Latinos en cargos oficiales es lo que talvez ha causado el cambio en perspectiva. “Se necesita tener calidad y buen liderazgo”, dijo Solís, quien apoya a Harris. Ella dijo que Harris está al lado correcto de los temas de importancia para los latinos californianos. “Conozco a personas que no son latinas que lucharan por nuestros derechos”, dijo. “Hemos evolucionado más aya del ver nada más el color de piel de alguien y ahora nos podemos enfocar en lo que la persona ofrece”, agregó. Otros lideres latinos prominentes incluyen al senador pro tem, Kevin de León y al vocero de la asamblea, Anthony Rendón, quienes junto con Solís apoyan a Harris. Esto, a pesar de que muchos esperaban de que ellos apoyaran a la latina con experiencia en el Congreso. Roybal-Allard le dijo a EGP que esto fue una sorpresa para ella. Puede ser una falta de conocimiento de lo que significa ser miembro del Congreso”, dijo ella. “Hay un set de reglas diferentes y Loretta [Sánchez] es alguien que empezaría con fuerza”, dijo la congresista, notando la importancia que se le pone a la precedencia y a los reemplazos establecidos. Sánchez le dijo a EGP que piensa que aquellos que no la apoyan, a pesar de sus calificaciones, fueron probablemente influenciados por políticas norteñas llegadas desde Sacramento. “No se trata de ser la latina”, dijo Sánchez. “En este caso, se trata de que soy la capacitada y tengo la experiencia”. Los respaldos exhibidos en la carrera también demuestran que el tema de inmigración no es lo único que les importa a los latinos. Héctor Barreto, presidente del Instituto, “Hispanic Business Roundtable”, le dijo a EGP que apoyan a Sánchez porque han trabajado con ella, personalmente, por décadas. “Loretta [Sánchez] siempre ha sido apasionada en ayudar a los negocios pequeños”, dijo él. “Fue una decisión fácil”, agregó. El grupo tiende a inclinarse al lado centro derecho, apoyando a candidatos conservativos como el senador John McCain y el senador Marco Rubio, durante ésta elección. Barreto dijo que el grupo está preocupado de que Harris redoble los esfuerzos que ya han perjudicado a los negocios que pasan dificultades, poseídos por latinos, apoyando el incremento de impuestos y costos de seguros médicos más altos. De acuerdo al Instituto, “Hispanic Business Roundtable”, hay cuatro millones de negocios de latinos a lo largo del país, que generan $700 billones en ingresos cada año. En cambio, Sánchez ha sido campeona en el Congreso, luchando por obtener mas contratos para negocios pequeños, ayudándolos con su acceso al capital, dijo Barreto. “Si podemos apoyar al candidato hispano, lo haremos, pero no apoyamos a un candidato [simplemente porque] sea hispano”. Para aquellos que no estén seguros por quien votar, la asambleísta, Cristina García, espera que últimamente escojan el nombre de Sánchez. “Hicimos nuestras investigaciones por nuestra parte para traer a este miembro a la balota; ella es la capacitada”, dijo García. El congresista Xavier Becerra le dijo a EGP que decidió en no mandar su apoyo al senado, y en lugar se está concentrando en apoyar a los latinos que están corriendo para tomar puestos en la Cámara de Representantes. Él le dijo a EGP que está contento en ver que los latinos no están ausentes y que a veces hasta hay más que uno. “Sin duda, cuando escucho que hay alguien latino en la carrera me cuasa interes”, dijo. Solís predice que los latinos tendrán otra oportunidad cuando la senadora Diana Feinstein se retire. Algunos observadores políticos especulan que tratos se hicieron, desde temprano, para que un latino recibá el puesto cuando Feinstein se retire. Mientras tanto, Padilla le dijo a EGP que su oficina eligió en no apoyar a nadie en ésta elección pero dijo que la carrera al Senado refleja la diversidad del estado. “No importa si es la carrera para el Senado o para el gobernador de California el año entrante, estoy seguro que no habrá ninguna elección estatal sin un nombre latino”. Much is being made these days of the potential power of the Latino vote, both here in California and on the national stage. Political strategists point to the role Latinos played 8 years ago in tipping the presidential race in Barack Obama’s favor, and continue to say that if Latinos register and show up to vote they could again have sway in the 2016 Presidential Election pitting GOP candidate Donald Trump against Democrat Hillary Clinton. At more than 57 million strong, or nearly 18% of the total U.S. population, and with the largest growth in recent years taking place in areas that according to the Pew Research Center previously had very few Latinos, like North Dakota, there’s good reason to see political opportunity. But it wasn’t too long ago that the influence of Latinos was more dream than reality. Latino elected officials were rare and for many Latino political and civil rights activists the most important credentials for a candidate was that they have a Spanish surname and be a Democrat, and you always supported the Latino in the race. And for more than a decade, immigration has been the top issue in nearly every campaign to reach Latinos. For this two-part story on the influence of Latinos in politics today, EGP reached out to a number of Latino elected officials from California to get their views. What we repeatedly heard is that there has been progress, but there’s still a long way to go. We also heard that immigration will continue to be an important issue to Latinos, but these days “every issue is a Latino issue.” And while being Latino is important, in the political arena it alone may no longer be cause for endorsement. 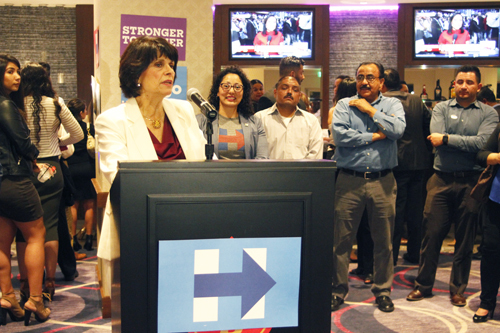 Congresswoman Lucille Roybal-Allard, the first Mexican-American woman elected to Congress, is excited to see the new batch of Hispanic leaders on both sides of the aisle in Congress. She just hopes these new lawmakers understand the discrimination their predecessors faced, the struggles to get Latinos elected in the first place, and the significance of having one of their own sitting at the table where the country’s most important decisions and policies are made. Roybal-Allard witnessed first hand the discrimination against Latinos brave enough to run for office, and determined to pave the way for future leaders despite their poor treatment. Her father, Edward R. Roybal, the first Latino elected to the Los Angeles City Council and one of the first Latinos to represent California in Congress, was one of them. Getting elected at a time when many people would just vote against a candidate because they were Hispanic was difficult, and it took a strong grassroots effort in the Latino community and help from labor unions to win Roybal a seat on the LA City Council. Even then, he was not treated as an equal because of his Mexican heritage. The discrimination continued when he was elected to the Congress, and invitations were not extended his way. “We would go to places and people would spit on us and tell us to go back where we came from,” she recalled, noting that his position was no guarantee they would be treated with respect. But he persevered and during his 30 years in Congress, Roybal co-founded and chaired the Congressional Hispanic Caucus and chaired a powerful Appropriations subcommittee, and always advocated for Latinos. Roybal-Allard had her own encounters with discrimination as an elected official. 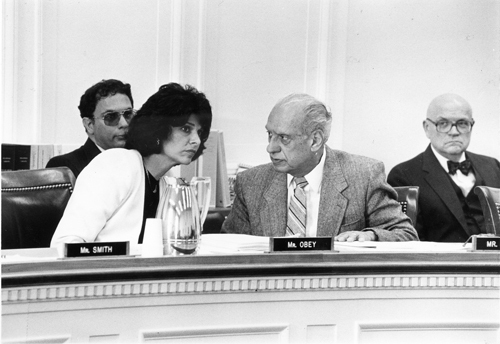 She told EGP that during the early 1990s she and the other Latinas in Congress were routinely stopped at the door of the House of Representatives, the assumption being they could not possibly be members of Congress. “Many of my colleagues didn’t know what it meant to be Hispanic,” Roybal-Allard said, pointing out that African-Americans were the only minority some of her Congressional colleagues had ever met. “Absolutely we have made some progress, but we still have a long way to go,” she added. As a female, minority and often the youngest person in the room, Los Angeles County Supervisor Hilda Solis says she faced similar obstacles on her way to the White House. Her high school counselor advised her to skip college and to go work as a secretary, ironically, years later she would became the first Latina to serve as Secretary of Labor, appointed by President Barack Obama. In another first, Solis was the first Latina elected to the California Senate. California Secretary of State Alex Padilla, the first Latino and youngest person elected president of the Los Angeles City Council, told EGP that the rhetoric in this year’s presidential campaign reminds him of the political climate that existed in 1994 when Proposition 187 – which proposed to prohibit undocumented immigrants from receiving public benefits ¬– was on the ballot. It was then, years before he ran for office, that he says he realized it wasn’t easy for Latinos in government. Although both sides of the aisle are now courting Latinos, for too long Latinos were often on the outside, says Becerra. Republican and Democratic political pundits and strategist across the country have repeatedly said that winning the 2016 Presidential Election will require winning a majority of Latino votes. Yet one need only look at the number of “political firsts” in recent years – Sonia Sotomayor’s becoming the first Latina on the U.S. Supreme Court, Antonio Villaraigosa’s election as Los Angeles’ first Latino mayor in over a hundred years, and for the first time in modern history, Latinos now hold the top two leadership roles in the California Legislature – to understand the relative newness of Latino political influence at the ballot box. All the Latino leaders we interviewed, however, said you have to celebrate these milestones, not just look at the deficits. As an example, U.S. Secretary of Housing and Urban Development Julian Castro, Secretary of Labor Thomas Perez and Congressman Becerra were all touted as possible running mates for Hillary Clinton. More Latinos now serve on the most powerful congressional committees that decide which bills move forward and get funding, and in the case of Roybal-Allard, the ranking member on the House Homeland Security Appropriations Committee, how we will pay for our national security. Only 37 of the 535 members of Congress are Latino, but according to Roybal-Allard, many of them are better prepared for the rigors of the office then their predecessors. “The more Latinos get elected the more input and influence we have on policy,” she stresses, adding that the hope is more Latinos will be elected in November. In California, where about 15 million Latinos call home and make up 39 percent of the population, many leaders still see Latinos as “underrepresented.” Of the 120 members in the Assembly and Senate, only 22 are Latino. However, the leaders of both bodies are Latino: Senate Pro Tem Kevin de Leon and Assembly Speaker Anthony Rendon. But the small number does make it harder for “for us to be a voice for Latinos,” says Assemblywoman Cristina Garcia, who represents a number of Latino majority cities in southeastern Los Angeles County, including Bell Garden and Commerce. “We need to be at the table,” she said, explaining her desire to see more Latinos and Latinas elected to office. “It’s helpful to our community when we have people that have personal experience with the needs of our areas,” agrees Roybal-Allard. Which leads back to the belief that every issue is a Latino issue. There is no difference between what a Latino wants and what their non-Latino counterparts demand from the government, says Becerra. “They want a good job, good education and a safe place to live,” he told EGP. Roybal-Allard believes that in some states where the Latino population is growing, fear and misunderstanding are contributing to the mistaken belief that Latinos will only fight for their interests, and somehow those interests are different. Solis acknowledges she acts as voice and advocate for the Latino community in Los Angeles County. She points out, however, that the issues and policies she has fought for, including increasing the minimum wage, enforcement of wage theft laws and for environmental justice, do not only help Latinos, but everyone. In part 2 of this two-part series, EGP will delve deeper into the November election and the potential of the Latino vote. COMMERCE – Getting local students and their families ready for college has long been a city goal in Commerce. As far as the city is concerned, it’s never too early to start planning for college or too late to get a college degree. Each year, the city’s Public Library and Education Commission holds a college fair where middle to high school aged students and adults heading back to school are able to meet with representatives from a wide range of colleges and universities and take part in workshops on everything from admission criteria to college life and finding financial assistance and scholarships. Commerce’s latest college resource fair took place Saturday at Veterans Park and despite scorching temperatures it again attracted residents from Commerce as well as nearby cities like Bell Gardens. Most Commerce residents attend schools in the Montebello Unified School District, but some do attend Los Angeles Unified schools. There is no high school in Commerce, however, so once students complete middle school they move on to high schools in other cities, including Bell Gardens and Montebello. 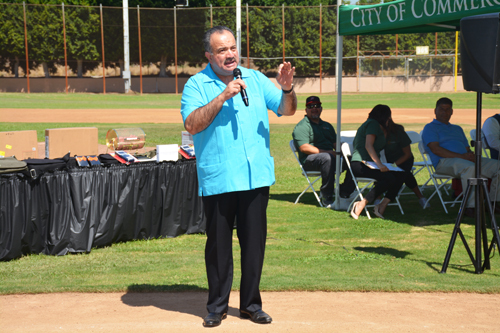 Los Angeles Community College District Chancellor Dr. Francisco C. Rodriguez was the keynote speaker Saturday at Veterans Park where this year’s college fair was held. “My speech is mainly four words,” Rodriguez told participants, showing the audience the white index card where he’d written those words. “Those four words are ‘No Fear’ and ‘No Borders.’ Don’t be afraid of dreaming big and don’t be limited by anything in this world,” the Chancellor said. “I shared a bit of my story as a first-generation college student, growing up in a household where my immigrant parents spoke no English and had limited formal education,” Rodriguez told EGP in an email. “Today, I serve as Chancellor of the largest community college district in the nation,” he said, pointing out that obtaining a college education is what made a difference in his life. Rodriguez told students not to be afraid to go to college or to ask for help when they need it. “Students have untapped potential that they are not even aware of” the Chancellor told EGP in his email. In 2017, in partnership with the city of Los Angeles, the LA Community College District (LACCD) will offer a free year of tuition to seniors graduating from an LA Unified public or charter high school. LACCD Board President Scott Svonkin said last week that the college district hopes to expand the “L.A. College Promise” program in future years, with the eventual goal being to provide free community college to all. In the meantime, while the program is being spearheaded by the city of L.A., Commerce families with a senior graduating in 2017 from an LA Unified high school can qualify for the free year of college tuition. 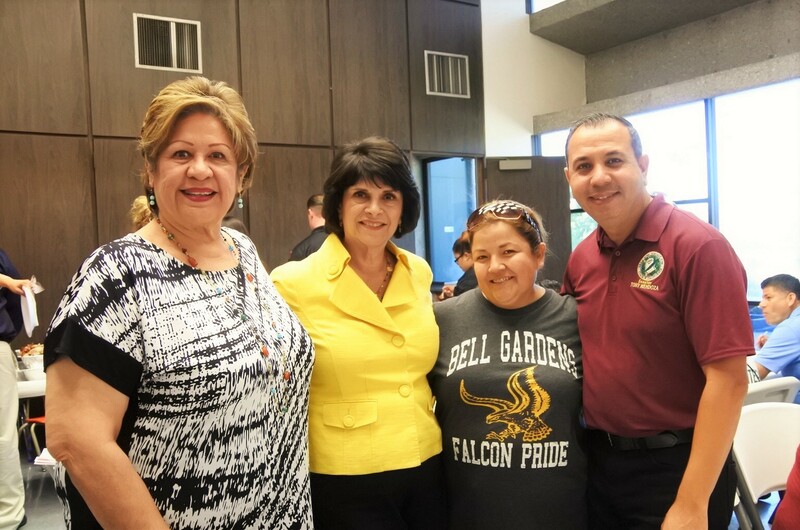 Also speaking Saturday was Congresswoman Lucille Roybal-Allard (CA-40) who represents Commerce and many of the surrounding southeast cities. Recognizing that paying for college can be challenging, Roybal-Allard and her staff shared information about her “Paying for College Student Resource Guide.” The guide contains a directory of scholarships, internships, fellowships, and other educational opportunities for students. 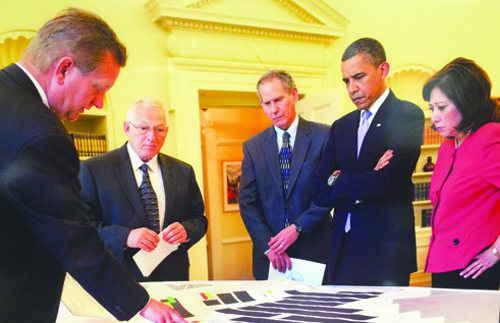 According to Roybal-Allard’s Office, the guide can be downloaded from her website at http://roybal-allard.house.gov/uploadedfiles/student_resource_guide.pdf. Commerce public libraries offer other college preparedness workshops to residents throughout the year, including SAT prep courses and financial aid workshops. For more information, visit the library website at www.cityofcommercepubliclibrary.org. Cada año, la Biblioteca Pública de Commerce junto con la Comisión Educativa, ofrecen una feria universitaria en dónde estudiantes de escuelas intermedias y secundaria pueden hablar con representantes de colegios y universidades. La feria tomó lugar el sábado en el Parque Veterans en dónde Francisco C. Rodríguez, el canciller de el Distrito de Colegios Comunitarios de Los Ángeles fue el orador principal. “Mi discurso consiste básicamente de cuatro palabras”, dijo Rodríguez al enseñarles el papel en dónde había escrito esas palabras. “‘Ningún miedo’ y ‘Ninguna frontera.’ No tengan miedo de soñar en grande y no se limiten por nada en este mundo”, dijo el canciller. La congresista, Lucille Roybal-Allard (CA-40) quien representa a Commerce y a muchas ciudades alrededor también asistió al evento. Ella compartió información acerca del manual “Paying for College Student Resource Guide”, compilado por ella, ya que reconoce lo difícil que es pagar por una educación universitaria. El manual provee un listado con información detallada de becas, pasantías, agrupaciones y otras oportunidades educativas disponibles para los estudiantes. La Bibliotecas Pública de Commerce también ofrece talleres de preparación a los residentes a lo largo del año, incluyendo cursos para el examen SAT y de ayuda financiera. Para más información puede visitar el sitio Web de las bibliotecas aquí. Durante su visita a la Feria Universitaria de Commerce, la congresista Lucille Roybal-Allard se reunió con (de Izq. a derecha) la concejal de Commerce Lilia, León, Martha Cabral y el Senador Estatal, Tony Mendoza. Foto: Cortesía de la Oficina de Lucille Roybal-Allard.